When your turn begins, gain 1credit if you have fewer than 6credit. Whenever you have 0credit, trash Dadiana Chacon and take 3 meat damage. "You want untraceable funds? I'll lend, as long as you have the ability to pay me back." If the Runner has both Dadiana Chacon and Order of Sol installed, can the Runner keep Dadiana Chacon from trashing herself by triggering Order of Sol first? No. Although the Runner can trigger Order of Sol first, Dadiana Chacon will still be trashed. As economy engines go the loan shark isn't the best. Although she doesn't require 2 link like Underworld Contact or 2 free MU like Data Folding having a card that only works when you have between 0 and 5 credits at the start of your turn isn't great. And she's unique so you can get best get 1 credit from her per turn. Oh, and should you actually get to 0 you get smacked around by her collection agents. Hang on, wasn't there some card that you want to take meat damage for? Clan Vengeance or something? It does work to get some counters onto Clan Vengeance, but it's still not a great deal. For taking 3 damage you get the ability to trash 1 card at random from HQ. Well, I guess it could work if you can get the corp agenda flooded and Jackson is out of the picture. And unlike most other sources of damage you can actually control this one. I'm kinda surprised this isn't an anarch card since it fits well with the anarch theme of damaging themselves to gain power. But maybe FFG made it neutral because of its lower general power level. Tip: I've Had Worse is good to have in your hand when Dadiana fires. Okay, so by "bad", I mean "hard to get benefits from." Because the first clause is totally fine: when you're poor the best thing is clickless money. Definitely something you want. But a big problem is actually the Unique part. Much like Human First, only having 1 in play means you're not getting much money for your deck slots. Obviously, taking 3 meat is pretty rough if this gets trashed. It's probably too much to want to combo it with Clan Vengeance or I've Had Worse. So you can protect it with something like New Angeles City Hall. You'd still be vulnerable to Hunter Seeker or Observe and Destroy. What about preventing the damage? Plascrete or Guru Davinder would be a bit expensive, but an even better option is probably Crash Space! And you know what card also loves Crash Space?? No, not Account Siphon. Well, okay, yes, but not what I was thinking of. I was gonna say...Tri-maf Contact!! You could have an economy engine of 2x Crash, 2x Tri-Maf, and a Dadiana. Even if you got All-Seeing I'd, you'd prevent the damage first and wouldn't die. And you'd feel like a daredevil for having all these cards on the table. Style points! Yeah, so that's a stretch. But it's an interesting alternative in a deck that doesn't want to spend influence and extra cards on MOpus. I'll definitely try it out at a casual meet-up. Dadiana plays nice with icebreakers that don't use regular credits. So she is good with Faust as well as Smoke with a stealth rig. 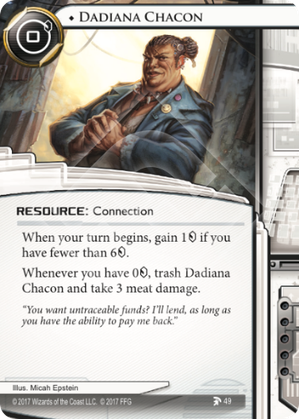 Also, because playing Sure Gamble with 5 will cause Dadiana to deal meat damage, running Easy Mark or other cheap economy options may be warranted for the cautious runner. Finally, both Personal Workshop and The Supplier allow runners to get cards out of their grip without worrying about taking damage from Dadiana. Just make sure that you have enough cards or credits after installation to survive the meat damage.